High Definition televisions are extremely popular today. They require their own separate way of maintenance. To stop anything from damaging your HDTV and to keep it showing the pictures in the optimal way it should, you should clean the tv screen every so often. When wiping the HDTV screen you have to follow the manufacturer’s instructions to the letter. You don’t want to ruin the TV over a simple mishap. Read the owner’s manual carefully that came with your HDTV and clean according by following all directions. Here is how you can clean your HDTV. Read on to find out more. Read all labels attached to any household cleaning products you plan to use. Even some glass cleaner solutions may be too harsh to use on an HDTV screen. Read the manufacturer’s instructions before you apply any cleaning product to the screen. Do not use chemical cleaners on your HDTV when you want to clean it. The chemicals contained in most common cleaning products are way to abrasive. They will damage the HDTV screen. Do not use liquid cleaners when cleaning your HDTV screen. Liquid cleaners and chemical cleaners will run into the TV screen and seep into the interior of the HDTV. This will damage the TV altogether. The effects of this can be seen in the image. The tv screen will show smudges in the pictures. 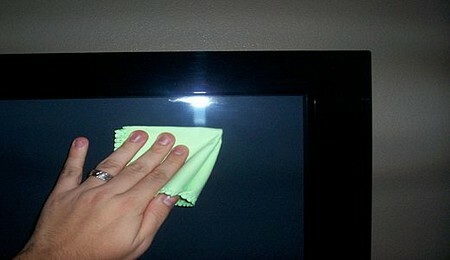 Use a microfiber cloth to wipe the HDTV screen. Wet the microfiber cloth very lightly. Wring the microfiber cloth out to remove excess liquid. You want it to be damp but not overly wet. Start cleaning schedule for the HDTV screen. Start to dust the tv screen every day. At minimal dust the HDTV every other day with the microfiber cloth. If this is done then no more maintenance will be necessary. Cleaning the HDTV on a regular basis will make it easier to maintain and also enhance the viewing experience. You can also ask visitors and family not to touch the TV screen. The natural oils from fingerprint and hands can be hard to remove. Food and other things can also be difficult to clean off. If you have to use another measure besides dusting to properly clean the HDTV screen, opt for good, quality, cleaning solvent specifically made for this task. Use tv cleaning solutions that are safe for use on all HDTV screens. This may include projectors and screens. The solution should also be safe to use around pets and children.